Since Nick was in Austin for most of last week, I took it as an opportunity to make a meat-free meal. I have a long back-log of vegetarian and meat-free recipes that I’d love to try, but rarely do I get the chance since they don’t always go over big with the meatatarian. He’s pretty often not home for dinner, but cooking for just myself seems like such a pain. But since he was gone for a while this time, I figured I’d whip something up I could eat all week. If you’ve been following my blog for a while, you know I loooove olives and all things Greek and Mediterranean. 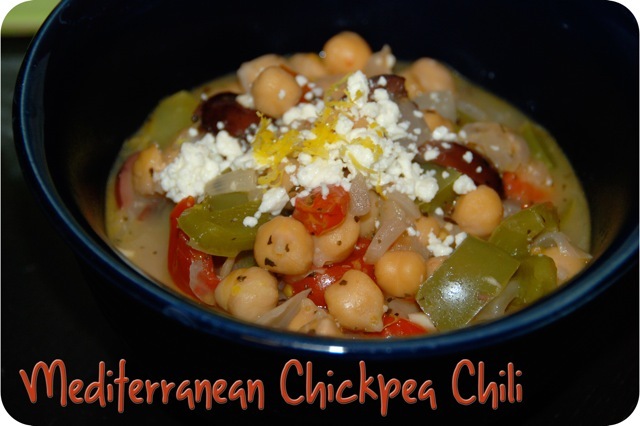 When I saw this chickpea “chili,” I knew I had to try it! In a Dutch oven, heat the oil over medium-high heat. 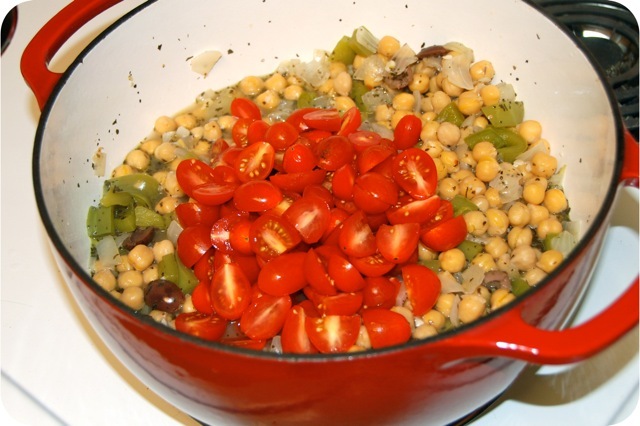 Add the onions, garlic, basil, and crushed red pepper, and cook 4 to 5 minutes, stirring frequently, until softened. Add the pepper and cook and stir for 2 minutes. 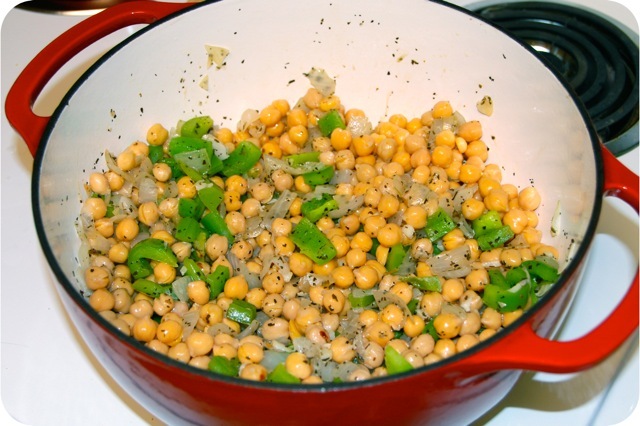 Add the chickpeas and cook 2 minutes more, stirring occasionally. 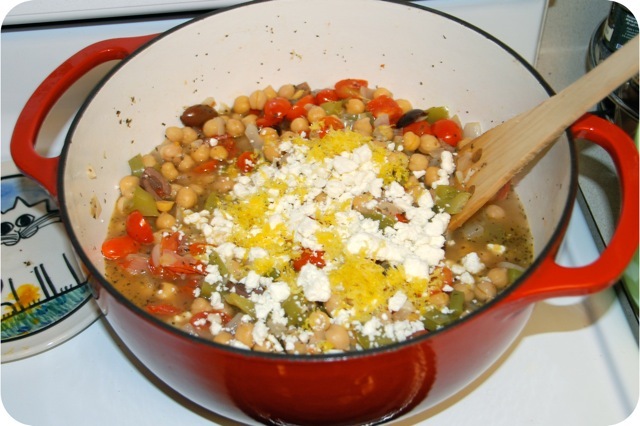 Add the broth and olives. Bring to a boil, then reduce heat to medium and simmer, uncovered, for 5 minutes, stirring occasionally. Stir in the grape tomatoes. Cook and stir for 2 minutes, just until wilted and heated through. Remove chili from heat. Stir in cheese and lemon zest and juice, until cheese is melted. Season to taste with salt and pepper. Serve topped with additional cheese. The “chili” was great! But… I’m not sure I would call it chili. I’m sure many people think of chili as a big bowl of beans (which would therefore classify this as chili), but I think of chili as being full of chili powder! And this was not. 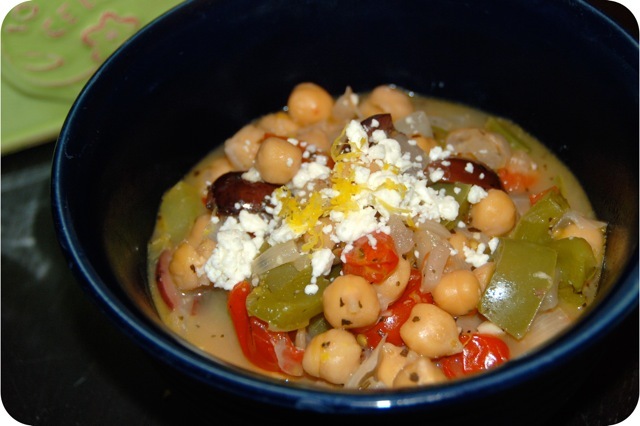 Still, chickpea stew doesn’t have quite the same allure, so I’m sticking with the original name! You could easily make this dish vegetarian by subbing veggie broth for the chicken. So whether you don’t eat meat or you just love a big bowl of flavorful veggies… go make this now! The chick pea in the front has a little face on it. So cute. Haha… nope, didn’t notice. How funny!